The PT210 is a smart indicator for industrial weighing process applications offering powerful PLC integration facilities; standard serial ports such as RS-232C, RS-485, up to 4 digital inputs and 5 relay outputs. The PT210 Series is approved by Weights & Measures Authorities for use in Accuracy Class III applications with 10000 scale intervals in accordance with OIML R76. 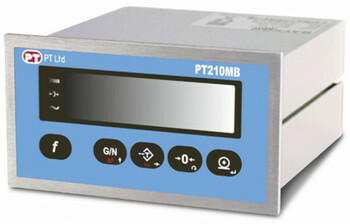 The PT210 is available in a range of versions to connect by various fieldbus protocols such as Ethernet, Modbus, Profibus, Profinet, CANopen and also a version with analogue output. Powerful calibration options including vCal, Electronic calibration without test weights supporting fast easy setup and service. The PT210 features adaptive filtering for fast settling, high display resolution and a speed of up to 1600 conversions per second. It’s small size aluminum body is perfect for panel installations, providing a big display and requiring little space on control panels. The instrument has a stainless steel front for use in harsh environments. Manual for operation and set up of PT210 indicator, MB, AN and CO variations.